Everybody knows that Marcus 'Buchecha' Almeida is an absolute monster. 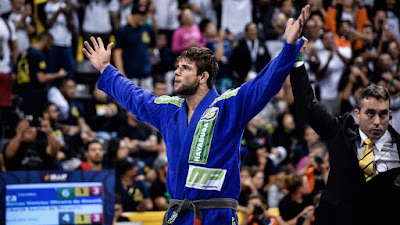 The 6-foot-2, 110kg (240lb) black belt is the undisputed king of jiu-jitsu right now, being a 10-time IBJJF world champion (five-time weight, five-time absolute). His long-awaited rematch with Roger Gracie goes down on Sunday, July 23 in Rio. They'll fight in a 15-minute match scored by IBJJF rules. What are the main factors that make Buchecha so dangerous? Here are four things that Roger Gracie needs to avoid when they take to the mats. Buchecha's wrestling-based style of takedowns contrasts with that of Roger's classical judo background. Buchecha has trained extensively with Jacob Harman of Churchboyz, and it shows in his aggressive go-forward style. Buchecha favors blast double legs and trips from body locks, both of which could work well against Roger's upright stance. One of the most impressive things about Buchecha is that he's extremely technical for a big guy - that is, until he needs to hulk out. His game is very open and relies on a lot of movement, but this can sometimes see him lose position and end up in bad spots. Not that it's an issue, because nobody can hold him down for long. When he picks up momentum, Buchecha is like a runaway train, smashing everything before him. He will run through defenses and overwhelm his opponents with his size and power. This is probably where Gracie is best equipped to deal with Buchecha, as few people can expect to physically bully him. Don't think Buchecha won't try though. Something everybody remembers from the first match between these two is when Buchecha shockingly caught Roger in an armbar. Ultimately the attempt was unsuccessful, but it's something we see from Buchecha a lot -- he's opportunistic in his attacks and if he sees something undefended he'll dive on it from any angle.